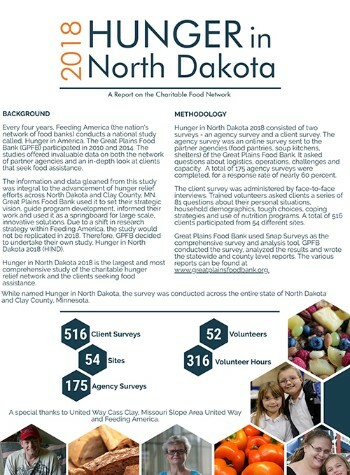 FARGO, N.D. – The Great Plains Food Bank has completed Hunger in North Dakota 2018 (HIND), a comprehensive study of more than 500 clients and 175 partner agencies (food pantries, shelters, soup kitchens) of the Great Plains Food Bank to identify trends about personal situations, household demographics, tough choices, coping strategies and the use of nutrition programs surrounding those seeking emergency food assistance. Conclusions drawn from HIND will help map the future for the Great Plains Food Bank, the largest hunger-relief organization in North Dakota. Clients reported making an average income of $12.54 per hour and $17,690 per year. Find more information and the complete study results for HIND HERE.